This is the Lead Post in a series on Eric Auerbach’s landmark work Mimesis. Mimesis: The Representation of Reality in Western Literature. I believe one of my high school English teachers—Mr. James Ritchie?—mentioned off hand that he thought I’d like it. Otherwise, how would I have found this sweeping view of Western culture as a high school junior, a view that inspired me to dedicate myself to literary study. In a titanic undertaking, its author, Eric Auerbach, proposed to trace the development of realism in Western literature, starting with Homer and ending with Virginia Wolf. Impressive as the effort was, his view, though still vital, has come to be seen as incomplete, even naïve, for a number of reasons. Various theories of language and schools of critical theory, for example, agree that words do not simply reflect or mime reality, that in fact gaps exist between all words and what they supposedly attempt to name. They create reality, textualizing it rather than reflecting it. 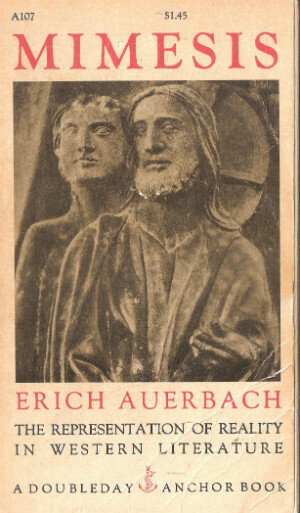 Other objections exist as well, including Auerbach’s contention that, “It was the story of Christ, with its ruthless mixture of everyday reality and the highest and most sublime tragedy, which had conquered the classical rule of styles.” This, he felt, was the engine that drove the West towards realism. Yet despite such objections, Auerbach’s accomplishment remains impressive—and moving. In his “Epilogue” he tells us he wrote the book in Istanbul during World War II, where the libraries were “not well equipped for European studies.” Mimesis has no notes. “International communications were impeded; I had to dispense,” he explains, “with almost all periodicals, with almost all the more recent investigations, and in some cases with reliable critical editions of my text.” Yet such absences forced him to write instead of being tempted to research more and more. But another reason also forced him to write: a heartfelt wish that his work would help heal a war torn world. “I hope that my study will reach its readers,” he concludes, “—both my friends of former years, if they are still alive…And may it contribute to bringing together again those whose love for our western history has serenely persevered.” I found, and still find, his last paragraph so moving. Most of my work has focused on literature by people of color. I suppose this series is my nod to the marvels of white culture. Over time I hope to publish short summaries and reflections on each chapter of Mimesis, but for now here is a simple list of them and some of their major subjects. Links will appear when the reflections become available. 1. “Odysseus’ Scar”—On Homer’s Odyssey contrasted with the story of Peter in the New Testament. 2. “Fortunata”—On passages from Petronius and Tacitus. 3. “The Arrest of Peter Valvomeres”—On Ammianus Marcellinius contrasted to Tacitus. 4. “Sicharius and Chramnesindus”—On Gregory of Tour’s History of the Franks. 5. “Roland Against Ganelon”—On the Chanson de Roland. 6. “The Knight Sets Forth”—On Chretien de Troyes Yvain. 7. “Adam and Eve”—On the Christmas play Mystere d’Adam. 8. “Farinata and Cavalcante”—On Dante’s Inferno. 9. “Frate Alberto”—On Boccaccio’s Decameron. 10. “Madame du Chastel”—On Antoine de la Sale’s l’Histoyre et plaisante Cronique du Petit Jehan de Saintre. 11. “The World in Pantagruel’s Mouth”—On Rebelais’ Gargantua and Pantagruel. 12. “L’Humaine Condition”—On Montaigne’s Essays. 13. “The Weary Prince”—On Shakespeare and the Elizabethan worldview. 14. “The Enchanted Dulcinea”—On Cervantes’ Don Quijote. 15. “The Faux Devot”—On La Bruyere’s Caracteres. 16. “The Interrupted Supper”—On Abbe Prevost’s Manon Lescaut. 17. “Miller the Musician”—On Schiller’s Luise Millerin. 18. “In the Hotel de la Mode”—On Stendhal’s Le Rouge et le Noir. 19. “Germinie Lacerteux”—On Edmond and Jules Goncourt’s Germinie Lacerteux. 20. “The Brown Stocking”—On Virginia Woolf’s To the Lighthouse. ♦♦♦ Go to a list of World Writers written about on this site. This entry was posted in World Writers and tagged Erich Auerbach, Mimesis: The Representation of Reality in Western Literature, Western realism. Bookmark the permalink.